Beaux-Arts Classic Products offers a timeless and elegant collection of Classical Wall Decor. Classical Interior Design Style focuses on the elements that create a space; the walls, ceiling and floor. The use of wall panels is a beautiful way to create the epitome of wall decor. 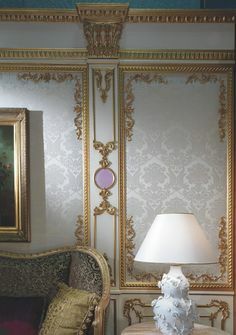 Shown below Louis XIV Wall Panels using a combination of panel sizes to give the wall a focal point and symmetry. When making decisions about the style for your wall decor using our wall panels we offer these Louis XIV wall panel options. Adding more or less ornamentation determines how much eye candy you desire for your classical wall decor. The wall panels are also very affordable considering you are covering a lot of plain drywall. Choose the style for your wall decor from four different wall panel designs. Add additional Wall Ornamentation such as a center headpiece. Georgian Headpiece for the Georgian Style Wall Panels $44. Large Floral Garland Swag can be used with the French Renaissance or Classical Style Wall Panels. There are notches in the Acanthus ends so that the moulding slides into the notch giving a clean join. French Renaissance Wall Panel with the Floral Swag. Wall ornamentation can be added within the frame created by the wall panels. One design is to install it directly beneath the center headpiece. Shown here our Louis XIV Double Headpiece Wall Panel with a Vertical Drop. So many possibilities for your wall decor when you start with wall panels. Just white walls and panels are beautiful. The wall space inside and outside the panels offers unlimited possibilities for the application of color, faux finishes, wallpaper, handpainted wallpaper, stencils, texture and more ornamentation. This beautiful installation has it all. Damask inside the panels plus additional corner ornamentation. The space outside the panels is used to create a narrow design on the base of the pilaster. 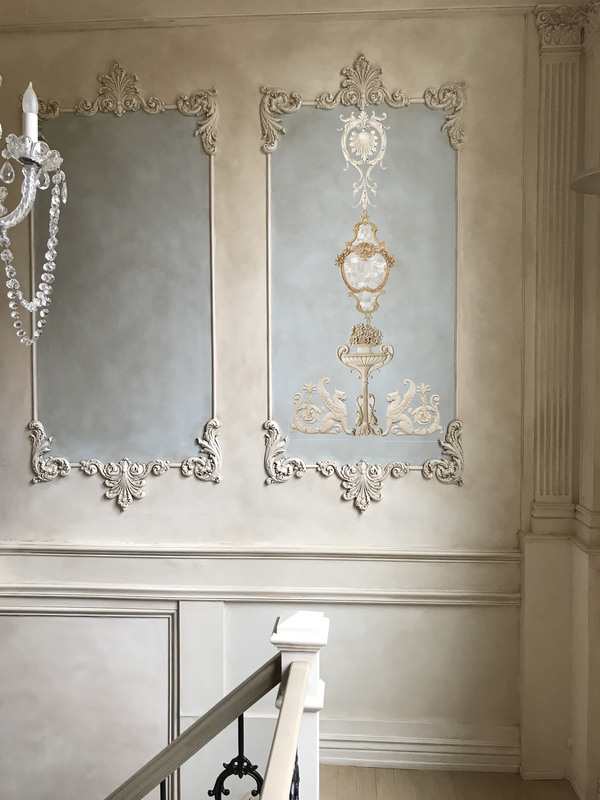 I decided to have some fun and added Wall Ornamentation to one of the Louis XIV Wall Panels in this two story foyer. I also added Mother of Pearl inside the rose frame. The wall ornamentation is very easy to install. Select the finish from our standard finishes or work with our artist to create a custom finish. The wall ornamentation is attached with adhesive caulk. In symbolism, the griffin combines the symbolic qualities of both the lion and the eagle. It is the king of birds and lord of the air united with the king of beasts and lord of the earth. In heraldry, the griffin’s amalgamation of lion and eagle is used to denote strength and military courage and leadership. Large Rose Frame – 5 parts $133 without Mother of Pearl. There is nothing in the marketplace like our Spanish Empire Wall Panel Ornament. It transforms board and batten style paneling into the most handsome wall decor. Please visit Wall Decor and Wall Ornamentation to see all of our FINISHED wall ornamentation. Ready to install. Wall Decor would not be complete without our handpainted canvas wall panels. This Georgian design is a historic reproduction. Georgian Hand Painted Canvas Wall Mural The actual design is 30 x 53″H. The height of the design is adjustable. The width is fixed. The panel can be made wider and taller by increasing the border around the design. Grotesque – a style of decorative art characterized by fanciful or fantastic human and animal forms often interwoven. Custom Damask Hand Painted Canvas Panels. Old Wood Finish coordinates with our Old Wood and Old Wood Gold Product Finishes. An elegant choice for a timeless and elegant embellishment to your wall decor.